In contrast to many travelers I didn’t ‘hit the road’ until much later in my life. Sure I had some occasional experiences traveling with family or joining some program that required some extended travel. However, my first ‘real’ forays into independent travel didn’t materialize until I decided to travel to India for initially three months. By the time I was done it was almost a full year before I returned home. Since then I have embarked on many solo journeys. It was this constant lure of the road that prompted me to examine what my motivations were about travel. One of the results of this was the development of the GlobalWalkabouts process and this blog. Early in my investigations I would interview people about their reasons for travel. I was often surprised and fascinated by some of the responses of people much younger than myself (i.e., in their 20’s). Perhaps their responses were a reflection of the developmental stage in their lives. However, I suspect, it was more a reflection of a learning process about travel. In the beginning, most people venture not too far from their place of origins. Over repeated forays into the world many expand their range and travel farther from home. This is not that much different from Harry Harlow’s (1958) research with infant monkeys. They would increase their physical distance from their mothers as they explored the world. Initially, there was a tentative sampling of the immediate surroundings. However, over time they continued to range further from their mother to explore more and then returned to the warm maternal embrace. Eventually, with maturity and experience, they spent large amounts of time a way from their “home”, now comfortable that it was there for them to return to. We all grow this way. And this is especially true when we embark on our individual travels. So it was understandable that many young people would share this aspect of journeying. One of the reasons for me to interview other travelers was the result of a hypothesis I was entertaining. I believed that underpinning all travel is an unconscious desire to connect with something bigger in us, to something that I felt was more spiritual. I was hoping by conducting these interviews that I would uncover this aspect of why we travel. I never did publish the results of these interviews. However, it did support this belief about the spiritual nature of journeying. Returning to my present discussion, I was, at first, taken a back by the responses of my younger informants. In hindsight, what they shared all made sense. Overall, they were not so much interested in where they were travelling to or about the cultural and historical dimensions of such locations. All this seems to emerge later. What primarily motivated many was the opportunity to exercise. The world was the occasion for strengthening and testing themselves. For me this was a wow! The world was some huge gym. After some self-reflection, I realized that this was an important, if not essential, reason for travel. By investing myself in traveling I was providing myself with an opportunity to grow myself, primarily at first, on a very physical level. This was especially true for me since I opted to do this solo and with a backpack. I was in my early thirties. 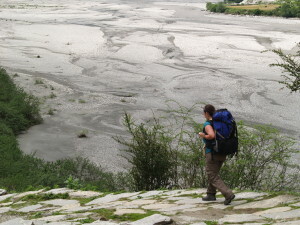 The aspect of physical exercise is obvious once you find yourself walking from village to village in the high Himalaya. But this is equally important as you constantly negotiate the transiting and arriving in different destinations. The getting on and off crowded buses, standing in line on long queues, walking down long dusty avenues in the heat with your luggage, hauling gear up and down back street hostels, or suddenly running to catch a last minute connection. It all demands a certain level of physical prowess. I think, however, what my young informants were conveying to me was much more. They had this delight in proving to themselves that they could handle such inconveniences and achieve their goals. Travel gave them an opportunity to test themselves in how they could cope and even flourish under demanding conditions. Many things come to mind about how I managed things while traveling. For instance, to keep drinking tea to stay hydrated as opposed to drinking water from bottles since they were often filled from taps and than sealed. Drinking the tea was safer since it was already boiled. Or remembering to first examine bedding for bed bugs before agreeing to a room for the night. And with food always peeling your own fruit. Travelers are full of all kinds of advice to cope. The point is that when journeying this way many opportunities arise to challenge you physically. To manage these successfully is a great accomplishment for the novice. There is a certain pride in how you are capable of dealing with things. And this also contributes to feeling more secure about your self. I would suggest that one of the joys and benefits of “hard travel” is this sense of managing and interacting with the world. In traveling this way we call on a host of skills to help us be flexible, deal with change and transitions, encourage perseverance, and cultivate endurance all while developing the capacity to tolerate ambiguity and differences. Over time we gain confidence in our self and more than likely learn to accept not only the world but also our selves. Harlow, Harry. (1958). The Nature of Love. American Psychologist, 13, 573-685. I try to read your blog posts and did today and loved it.